Philip Livingston was born 15 January 1716 in Albany, New York. He graduated from Yale College in 1737, married Christina Ten Broeck of Albany, New York, and entered into the mercantile business in New York City. Livingston was prominent in commercial and educational societies. He helped found the New York Society Library, the St. Andrews Society, the city's Chamber of Commerce, and King's College. King's College became Columbia University. Livingston entered the world of politics when he was elected to the Board of Aldermen. He was a member of the Board of Aldermen from 1754-1762; a member of the provincial House of Representatives 1763-1769, and served as speaker in 1768; and a delegate to the Stamp Act Congress in October 1765. Beginning in 1775, Livingston represented New York at the first Continental Congress. In the second Congress, he served on several committees. 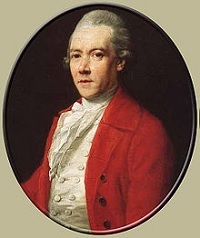 One delegate's description of Livingston: "There was a dignity, with a mixture of austerity, in his deportment, which rendered it difficult for strangers to approach him, and which made him a terror to those who swerved from the line or faltered in the path of personal virtue and patriotic duty." There were four Livingston relatives present in Congress on the eve of independence. They were Philip, his brother William and two cousins, John Jay and Robert. Philip was the only Livingston to sign the Declaration of Independence. The following year, Livingston was reelected to Congress by the State Convention and in May 1777 he was chosen a Senator for the Southern District of the First Legislature of the State of New York. In October of the same year, he was reelected to Congress and on May 5, 1778, he took his seat in the sixth session of the Continental Congress. This was a critical and dismal period in the history of the Revolution. The British had taken Philadelphia, requiring Congress to hold their sessions at York, Pennsylvania. Livingston's health was so compromised that his doctors gave him no hope of recovery. Yet, his patriotic spirit was so strong that he did not hesitate to attend the sessions of Congress. Philip Livingston died 12 June 1778 and was interred in Prospect Hill Cemetery, York, Pennsylvania. Goodrich, Charles A. Lives of the Signers of the Declaration of Independence. Hartford: R G H Huntington, 1842. Print.